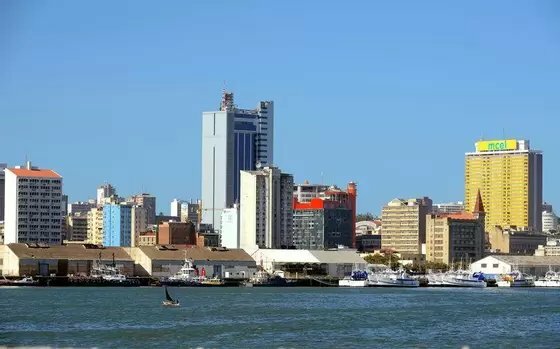 Fishing boats sit beneath the skyline of Mozambique's capital Maputo, April 15, 2016. The United Nations' Food and Agriculture Organization (FAO) on Tuesday launched a 3.6-million-U.S.dollars worth forestry project in the province of Zambezia in central Mozambique. The project, titled "Payment for Environmental Services to Support Forest Conservation and Sustainable Livelihoods," was aimed to promote biodiversity conservation and mitigate the impact of climate change on forest ecosystems. According to a press release from FAO, innovation, expansion and sustainability are priorities in implementing this new project, which will benefit about 150,000 rural inhabitants and special attention will be paid to women's roles in decision-making and benefit-sharing in all components of the project. The forest project will make sure that local communities benefit from the exploitation of the forests' resources through conditional payments linked to environmental performance indicators. The project will strengthen natural resource management committees, support communities to implement income-generating activities and use the values they receive to improve people's quality of life, the press release said. The project in partnership with the National Directorate of Forests of Mozambique will be operated in 7 districts in Zambezia, covering a total area of some 4 million hectares. Mozambique has about 40 million hectares of natural forests, of which about 27 million hectares are productive forests.